A 5-year-old boy learned the hard way that Columbus, Ohio, isn't the only place that hates Michigan -- apparently Oklahoma does too. 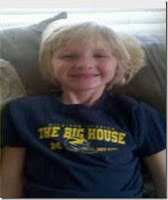 Young Cooper Barton wore his favorite Michigan shirt to Wilson Elementary in Oklahoma City and was told it violated the Oklahoma City Public Schools dress code and was asked to turn the shirt inside out. According to the dress code, students are only allowed to wear Oklahoma, Oklahoma State or apparel from another Oklahoma state school. Everything else is a violation (especially Texas). "They should really worry about academics. It wasn't offensive. He's 5," Cooper's mother Shannon Barton told News9.com. Remind me never to live in Oklahoma, for this and many other reasons. I remember last fall right before The Game, Coffeeson's school encouraged kids to wear shirts supporting their favorite team on one side or the other. Well, of course, he has a Michigan shirt, so I put it on him figuring two things: 1) He'd be outnumbered by fans of the other school, and 2) Surely there'd be at least one other kid wearing maize and blue. I of course was right about the first, and as to the second I was very wrong. And thus I spent most of the day worrying about what would be heaped upon him by his classmates. What I didn't take into account was that he and his classmates were 3 and 4 years old, and thus didn't really care. It probably won't be until sometime in elementary school when kids consciously realize the meaning and obligation behind wearing clothing supporting one school or the other. So, you see, I have a few more years before I have to worry for real. All this is to say, I guess, that school administrators shouldn't be piling on as well. According to the television station, the Oklahoma City Public Schools dress code was created in 2005 as part of a way to rid schools of gangs and gang apparel. Sports teams count as gangs now? So you only support gangs that like Oklahoma teams? A bit overboard, no? Good on Dave Brandon for this gesture. Too bad it'll be UMass, but hey, he gets to go to a Michigan game. Actually, I take back the "too bad it'll be UMass" statement. We make sure to take EVERY opponent seriously nowadays, I'm sure. I've watched replays of that game...um, let's say a couple times over the past year (read: pretty much any time I knew they were showing it on TV, plus clips on Youtube), along with replays of the 2011 Game and the 2012 Sugar Bowl, much to the eyerollingness of Coffeewife. Hey, last season was awesome, especially given what 2008-10 was like. I'm bracing for 2012 to be a bit of a step downward, what with facing Alabama right away, then Notre Dame, Nebraska, and the Akron State Urban Meyers on the road, plus losing a few keys from last year's team. And for the love of Pete, can we please beat Sparty this year? At any rate, for the next 3-4 months my Saturdays are spoken for. Phase 1: My commitment to Jesus is primarily an intellectual one. He is an idea I believe in, not a person I follow. Phase 2: I read through the Gospels again and realize that Jesus doesn’t want me to simply like him; he wants me to follow him. Phase 3: I buy the latest Shane Claiborne book, read it in two days, and resolve that following Jesus means selling all my things, sleeping with the homeless, and starting a monastic community. I begin looking into the cost of apartments in inner-city Nashville. Phase 4: I remember that I have a job, a mortgage, and a spouse (who hasn’t read Shane Claiborne). Phase 5: Heavy with guilt and overwhelmed by the insurmountable nature of my own convictions, I give up and revert right back to Phase 1. Following Jesus, it seems, just isn’t realistic. This cycle has been repeating itself for about three years now, but I think I may have figured out how to stop it…or at least make the ride a little less bumpy. Hey. That sounds familiar to me. Probably because I go through this kind of a cycle as well. The rest of the post reflects on what ordinary Christians with ordinary lives and responsibilities can do to be more faithful disciples, including a lot of small changes and substitutions that can add up to something much bigger. Your wife is expecting. "This is going to be pretty exciting," you say. They say, "You just wait." "You just wait, because you won't be getting any sleep anymore, once that baby's born. It's all over. It gets harder. It gets worse." Read the whole thing. He has one of these for every stage of a child's life, and then the last few lines come and you have to pretend you're wiping away dust from your eyes if you're reading it in the middle of a busy coffeehouse. Uh, that may happen, for instance. Misc. Jan on The Nuance-Savvy Pastor. Tony Jones compiled the results from his progressive blogger challenge on a Storify page...or at least some of them. Mine's not on there. What's up, Jones? Fake historian David Barton had one of his books pulled off the shelves because the publisher "lost confidence in the book's details." Score one for sanity.